Drs. Phillips and Jue understand that a missing or damaged tooth can create both aesthetic issues and problems with speaking or chewing which is why we are proud to offer dental implants at Phillips and Jue Dental. Dr. Jue has had advanced education and intensive training in dental implantology. In the past, dentures and bridges have been used as the most common solution for a missing tooth; but have you explored the time-tested, permanent option of dental implants? While traditional dentures have many benefits, there are also drawbacks. Not only is it sometimes difficult to find a perfect fit, dentures can slip, they can feel and look unnatural, and they are not permanent so they willl need to be replaced every five to ten years. While bridges may feel more natural, they require the dentist to grind down adjacent healthy teeth in order to install them. Dental implants are artificial roots and teeth (usually titanium) that are surgically placed into the jaw by your dentist. The custom made crown attached to implants are color-tinted and designed to blend in with your surrounding teeth. The result is very natural looking and often enhances or restores your smile! Because dental implants only affect the teeth that need to be replaced, there is no need to grind down adjacent teeth. And because implants are permanently fixed to the jaw bone, there is absolutely no slipping. 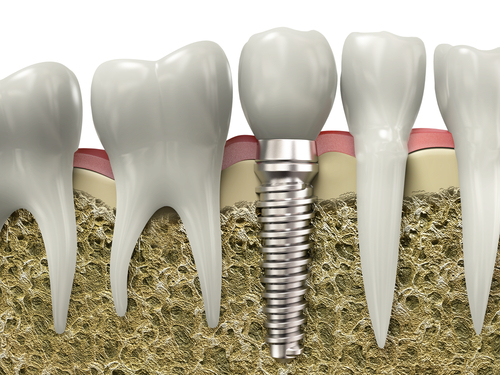 Dental implants are very strong, stable, and are as durable as original teeth. They will last for many years. Customized dental implants will give you the ability to smile with confidence and eat virtually anything you want! A dental implant procedure involves a multi-step process that will be completed entirely by Phillips and Jue Dental. X-rays and impressions (molds) are taken of the jaw and teeth to determine bone, gum tissue, and spacing available for an implant. Next, the area is numbed and a titanium rod is surgically placed under the gum tissue and directly into the bone. A temporary crown may be placed on top of the rod for three to six months so that the rod is allowed to heal and integrate itself onto the bone. Depending on the type of implant, a second surgery may be required in order to place the “post” that will hold the artificial tooth in place. With other implants the post and anchor are already attached and placed at the same time. After the rod has healed, in fact has fused itself to the jawbone, it is now considered a permanent part of your teeth. The final step in the procedure is the installation of a crown that has been custom-designed to blend in with your surrounding teeth. Dental implants are meant to be permanent. They only require your daily habits of brushing, flossing, and regularly scheduled dental check-ups and hygiene appointments. There may be an occasional need for tightening or adjustment. Please contact the Bakersfield office of Phillips and Jue Dental for more details on dental implants and implant dentistry. Call 323-1500 to find out if dental implants are your best solution for missing teeth. We look forward to helping you smile with confidence again!